New Dominion Chorale and Orchestra will present J.S. 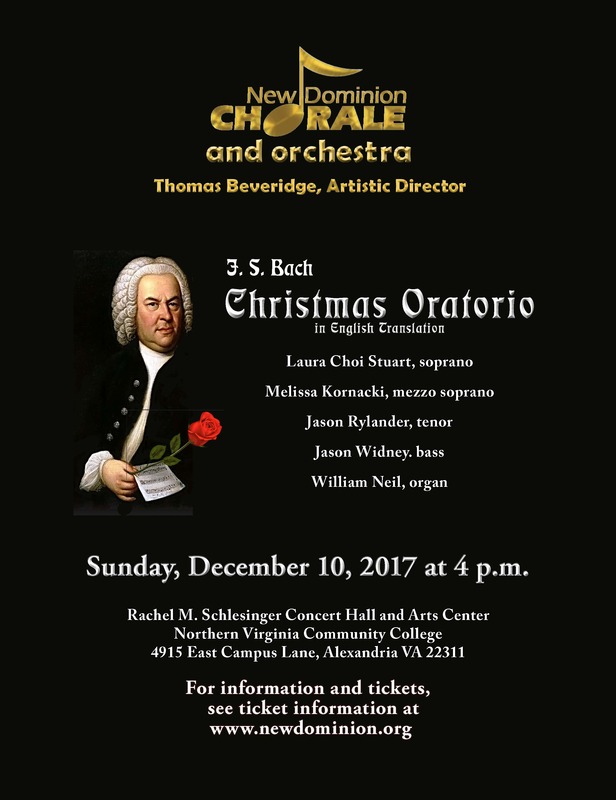 Bach’s “Christmas Oratorio” on Sunday, December 10, 2017, at 4 p.m. 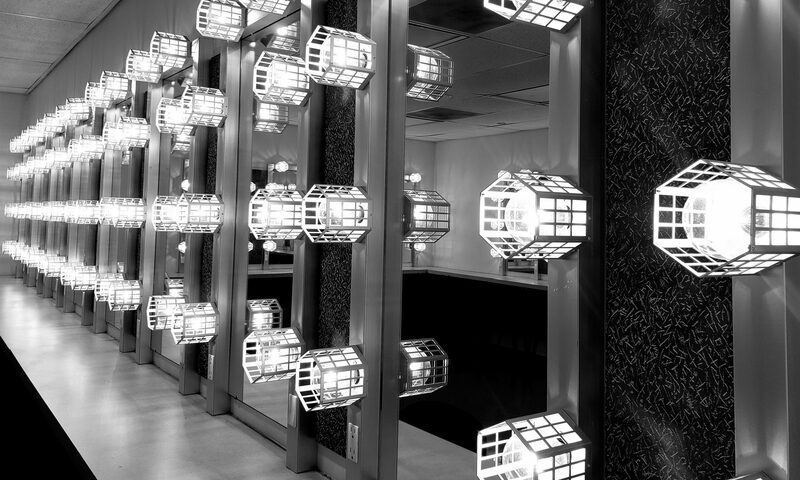 The concert will take place at the Rachel M. Schlesinger Concert Hall and Arts Center on the Alexandria Campus of Northern Virginia Community College, 4915 East Campus Drive, Alexandria, Virginia. The concert will be conducted by Artistic Director Thomas Beveridge and will feature well-known soloists from the Washington area: Laura Choi Stuart, soprano; Melissa Kornacki, mezzo soprano; Jason Rylander, tenor; and Jason Widney, bass. William Neil, organist of the National Symphony Orchestra, along with an orchestra of baroque instruments will provide the accompaniment. Bach’s “Christmas Oratorio” is a massive work consisting of six cantatas dedicated to the celebration of Advent, Christmas and Epiphany. In this concert, the Chorale will perform the first three cantatas in an English translation by Mr. Beveridge. The audience will be provided with the English words and melody of each of the chorales in this performance and will be invited to sing along with the chorus and orchestra. The 200-voice New Dominion Chorale is one of the Washington area’s largest choral societies. The Chorale has received consistent praise by music critics, particularly by Joseph McLellan, the late chief music critic of The Washington Post, who wrote, “New Dominion Chorale’s performance was opulent, precise and powerful…totally clear diction and a wide dynamic range.” In addition to its regular appearances at the Schlesinger Center, the Chorale has also performed at the Concert Hall of the John F. Kennedy Center for the Performing Arts, the Washington National Cathedral, and the Washington Hebrew Congregation. Thomas Beveridge, Founder and Artistic Director of New Dominion Chorale, has appeared as bass soloist with many of the nation’s choral societies and orchestras and performed in recitals in the United States and Europe. He is the composer of 700 original compositions and arrangements, with commissions from Harvard University, the Choral Arts Society of Washington and the Elizabeth Sprague Coolidge Foundation at the Library of Congress. 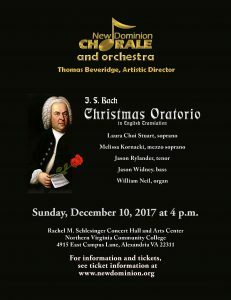 Tickets for the December 10 performance of Bach’s “Christmas Oratorio” may be purchased online at www.newdominion.org or at the door at the time of performance. Ticket prices are $35 for adults, $30 for senior citizens and $15 for students and children. Group tickets are available for groups of 10 or more at $25 per ticket. All tickets are for general admission. More information is available at www.newdominion.org or phone (202) 244-7191. Parking is free.